This colorful and trendy design is buzzing with character! Each personalized mint tin will arrive brightly colored as you see above. 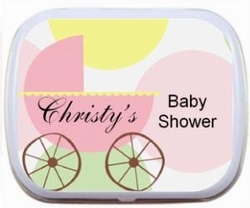 Colorful dots and pink carriage will be splashed on this baby shower favor! Personalize the mint tin with the text of your choice.